This is what we offer you for the SwingLuxDay December edition to close off a swinging 2018 with a great workshop and Roaring 20’s party with live music by the Duke Box! This SwingLuxDay is all about Charleston; the fun and energetic dance from the 1920s and 30s. We have for you a charleston beginner and intermediate class and the ‘Charleston stroll’ solo jazz routine! This class will cover the basics of partner Charleston. It is open to absolute beginners and to those who want refresh their charleston basics. Charleston Stroll is a simple and fun solo routine which was originally created by a dancer from Singapore. You will learn some of the classical solo jazz steps, that you can show off later in the party! This class is open for all levels, including absolute beginners. Spice up your charleston steps and moves! In this class, you will polish up your kick steps through basic moves like charleston swing out, sailor kick and etc. We will add surprising and fun elements in variations for your charleston moves ? This class is for dancers who know basic kick steps for any 6 and 8-count moves. After classes we’ll have a charleston theme ‘Roaring 20’s’ party at Altrimenti! Come with your fanciest vintage outfit and participate in the dress-up contest! The best dressed ‘lead’ and ‘follow’ will win a special prize! Party entrance is for free when you sign up for a workshop track. Ceren is a lover of old time swing era movies since her childhood. From the moment she saw Lindy Hop social dancing at a music festival, all she could think about was to be a part of it. She started dancing Lindy Hop and Authentic Jazz as a member of Istanbul Lindy Hoppers and later became a local teacher for Istanbul Lindy Hop community. Ceren, as a dedicated lindy hopper, perceives Lindy Hop as a foreign language that allows us to communicate with each other and share beautiful moments in many different ways. Dancing has been always one of the favorite things to enjoy himself for Bahadir. He was introduced to Lindy Hop through a friend and he loved it instantly. He started dancing Lindy Hop and Authentic Jazz as a member of Istanbul Lindy Hoppers. His authentic way of dancing is highly appreciated in the international scene. He strongly believes the true authenticity of every individual makes Lindy Hop so special. Currently, he is based in Istanbul and very glad and excited to share his lindy love with all of you! 1) Full refund with a 5€ administration fee will be possible up until December 13th, 2018. 2) No refund is available for any cancellations made after December 13th, 2018.
a) The new student is purchasing the ticket: this means the new student is interested and will attend the same class(es) of the student selling the ticket. b) The financial aspects of this transfer must be conducted privately between the two individuals. 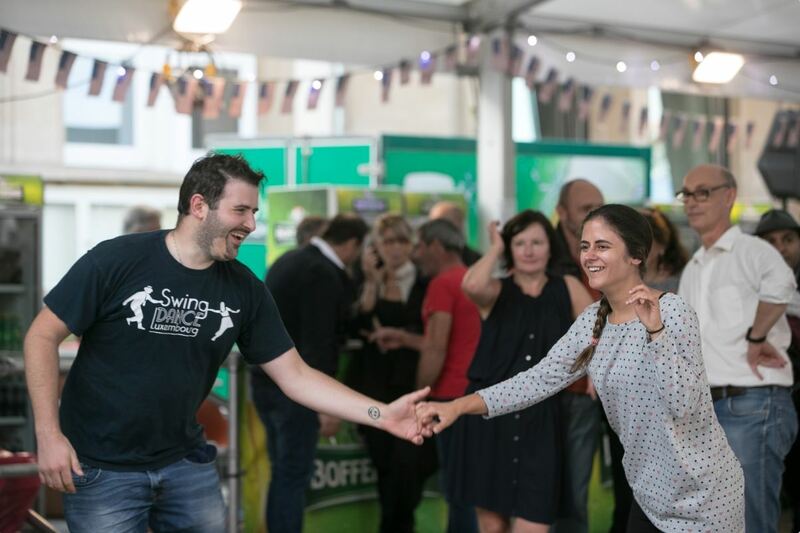 c) The original ticket holder must inform Swing Dance Luxembourg (SDL) of the transfer. d) The communication of this transfer to SDL must take place no later than December 13th, 2018. Please note that non-marking indoor shoes are required. The classroom‘s floor is excellent for dancing, but also delicate. As such, we cannot allow outdoor shoes, high heels, shoes leaving marks, etc. non-marking: the soles of your shoes do not leave marks when dragged over a wooden floor. indoor: the shoes are only worn indoors and never outdoors.